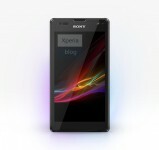 We have received word of a new Sony Xperia C670X handset that is due to launch this summer. The information comes from a tipster who recently provided us with the Android 4.2.2 Jelly Bean screenshot for the Xperia Z. Obviously, as with any rumour, treat all of the following with a pinch of salt. In terms of specifications, the Sony C670X is expected to come with a slightly smaller display than the Xperia Z (C660X) at 4.8-inches but will still have a full HD resolution of 1080 x 1920. The C670X will be powered by a Qualcomm Snapdragon 600 (APQ8064T) chipset with 1.8GHz quad-core processor and Adreno 320 graphics. Other features include 2GB RAM, 32GB internal storage and a 13MP Exmor RS camera. We are told the phone is due to launch in the middle of 2013 with Android 4.2. Along with all of this spec information, we were sent a render of the Sony C670X. We cannot tell from the picture if the C670X has a heavy glass influence like the Xperia Z or uses aluminium. Judging from the render, the ear speaker is similar in style to the Z/ZL. It looks like the top of the phone includes a front-facing camera , notification light, light sensor and proximity sensor. Given that the expected release is still a number of months away, the design may end up changing prior to launch. This is perhaps why there are no app icons in the display area, the render only shows the latest Xperia wallpaper. Anyway, that’s all we have for now. As mentioned before, treat all of this firmly as a rumour.